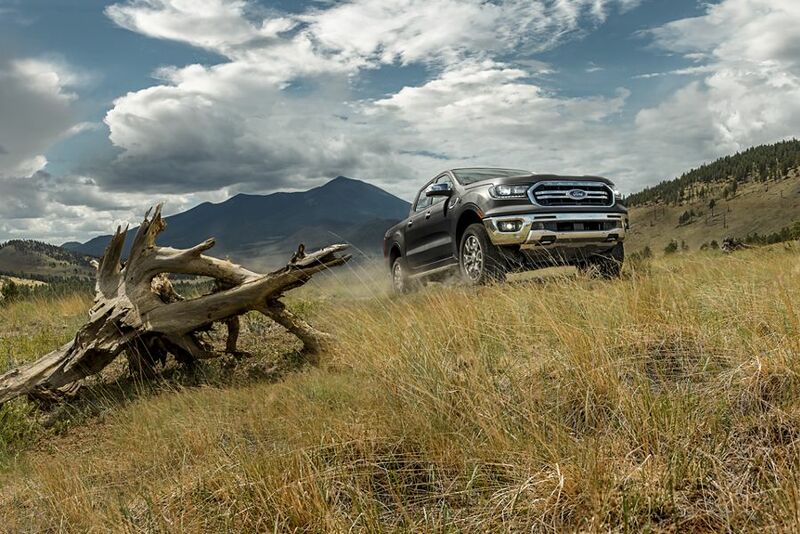 The 2019 Ford Ranger is engineered with the toughness to take you on off-road adventures that few other vehicles can. The all-new Ranger brings confidence and enjoyment to the driving experience, courtesy of its impressive array of available technologies — from the driver-assist features in Ford Co-Pilot 360™ , to voice-activated SYNC® 390 and FordPass Connect™ 112 and to finish it off, the outstanding performance of the B&O Sound System by Bang & Olufsen. 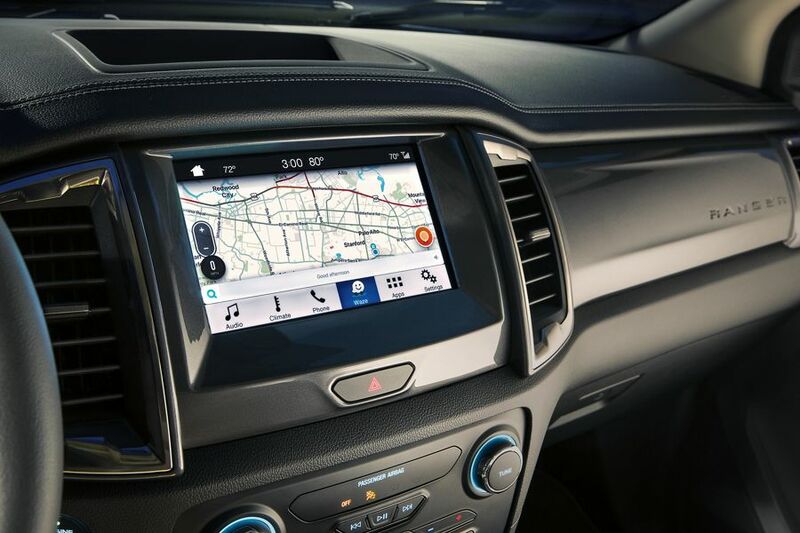 Introducing Ford Co-Pilot360™ — a suite of advanced driver-assist technologies* that can help you navigate our increasingly crowded roads and highways with greater confidence. Features included are BLIS® (Blind Spot Information System)10 with coverage for both the truck and trailer, Lane-Keeping System, Pre-Collision Assist106 with Automatic Emergency Braking10 (AEB), Auto High-Beam Headlamps and rear view camera.10 Ford Co-Pilot360 comes standard on Ranger XLT and LARIAT and is optional on Ranger XL. *Driver-assist features are supplemental and do not replace the driver’s attention, judgment and need to control the vehicle. Lane-Keeping System does not control steering. Pre-Collision Assist with Automatic Emergency Braking (AEB) will alert you if it senses a potential collision with a car or pedestrian in front of you. If you don’t react in time, the brakes will precharge and increase brake-assist sensitivity to provide full responsiveness. If corrective action is not taken and a collision becomes imminent, the brakes can apply automatically. Horsepower and torque ratings achieved using 93-octane fuel. The available BLIS® (Blind Spot Information System) with trailer coverage* alerts you when a vehicle is detected in the blind spot of your Ranger. But its capability doesn’t stop there. To help when you’re towing, it also alerts you when a vehicle is detected in the blind spot of your trailer. *Max trailer length is 10 m (33 ft.). Available Lane-Keeping System can alert you to unintentional lane drifting. Should you begin to drift out of your lane, the available lane-keeping system can alert you by vibrating the steering wheel and/or apply steering torque, to assist you to steer the vehicle back into the lane. 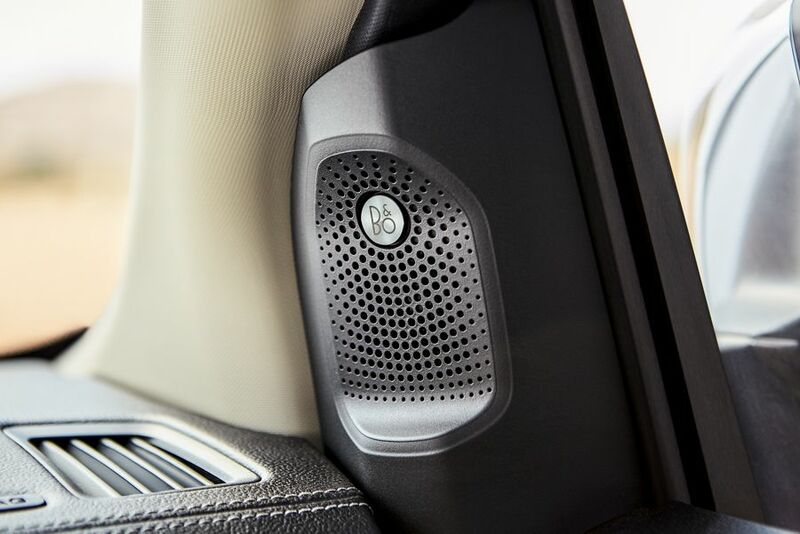 Enjoy outstanding entertainment with the power and clarity of the available B&O Sound System by Bang & Olufsen, designed to create a customized audio experience by incorporating specifically tailored speaker placement, tuning and calibration. Among its features: an integrated microphone monitoring background noise to ensure outstanding playback, up to 675 watts of amplified power and 10 premium speakers. Built Ford Tough® isn’t just a slogan. 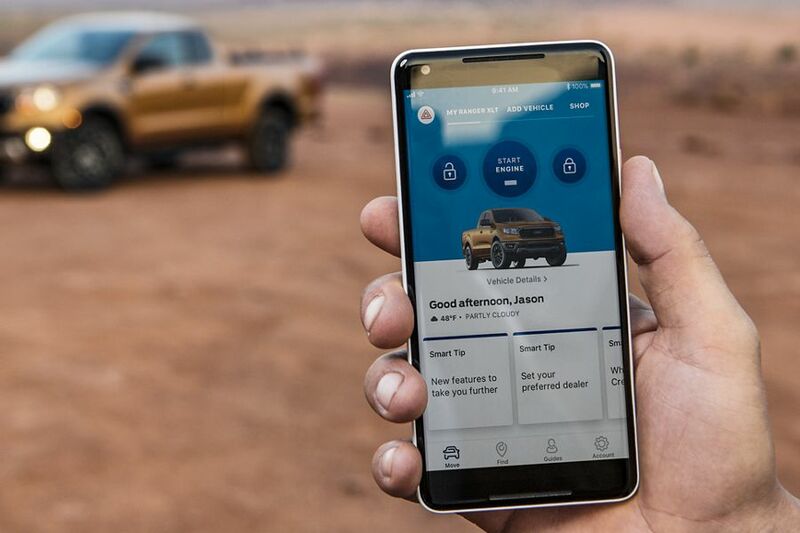 It’s an attitude that runs deep in the history of Ford truck engineering and has produced Canada’s popular lineup of rugged and dependable Ford pickups. 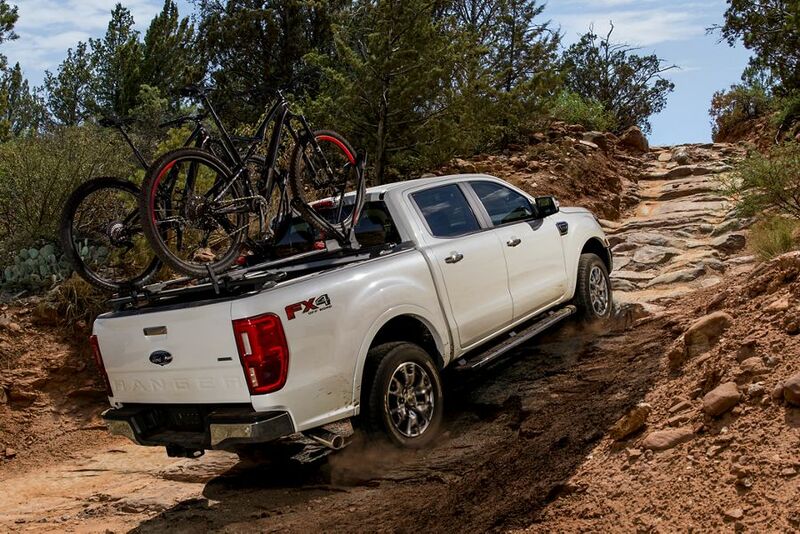 That lineup is even more remarkable with the all-new 2019 Ford Ranger, tested under conditions more extreme than you would ever likely encounter. Go ahead and set a date for your next adventure. 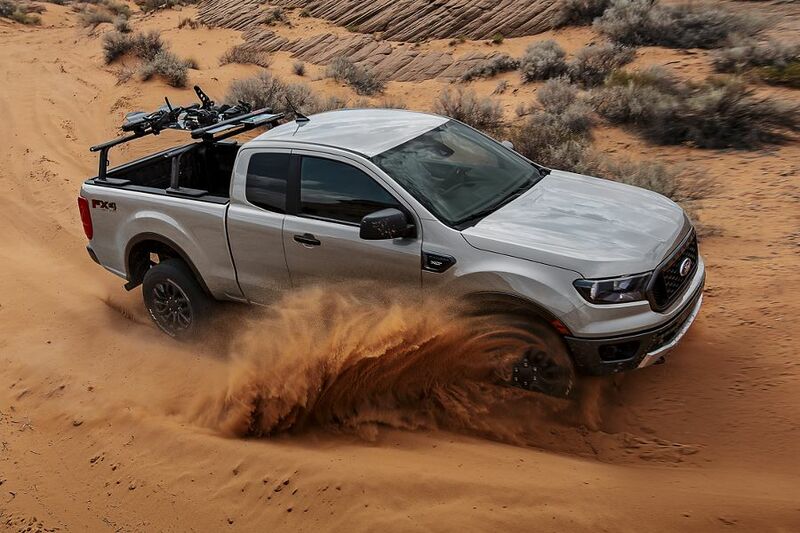 Ford engineers set a gruelling test regimen to prepare the new Ford Ranger for the demands of all-terrain travel. Durability trials on roads so punishing that robots were called in to do the driving. Days of constant shaking in the lab to help identify and eliminate squeaks and rattles and to tune suspension parts and body mounts for durability and performance. Towing heavy loads for hours up steep grades at 37.8° Celsius (100° Fahrenheit). Brutal traversing under heart-pounding, bone-jarring off-road conditions. The new Ford Ranger. It’s more than up to the challenge of taking on your toughest test. Raw torque rules when it comes down to taking on the rugged conditions you encounter off-road. 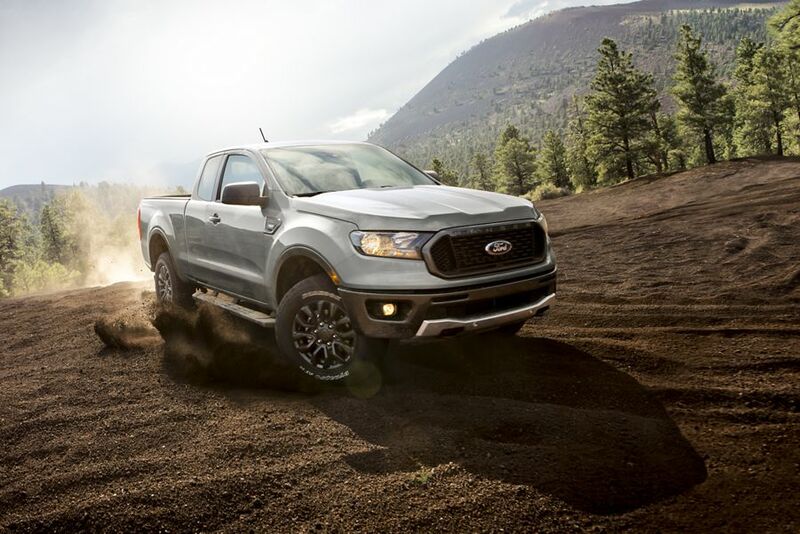 The new Ford Ranger beats all other gas-powered pickups in its class with a torque rating of 310 lb.-ft.* The 270 horses under the hood are mighty impressive too. The 2.3L EcoBoost® is engineered with a twin-scroll turbocharger that extracts exhaust gas from pairs of cylinders in alternating sequence, maximizing pulse energy to the turbine wheel for responsiveness on demand with virtually no lag. The 10-speed SelectShift® automatic transmission, featuring Ford-patented technology, optimizes gear progressions and delivers smooth, quick shifting up and down the gearbox. For all the power it generates, the 2.3L EcoBoost® is highly fuel efficient,* courtesy of its direct-injection (DI) system. With DI, gas is injected at high pressure directly into the combustion chamber in a very precise measure. The engine also features Auto Start-Stop Technology. When you come to a stop, the engine shuts off to help reduce fuel consumption and restarts immediately when the brake is released. Designed smart for truck applications, auto start-stop deactivates in situations that demand instant responsiveness, such as when you’re towing a trailer or running in four-wheel drive. 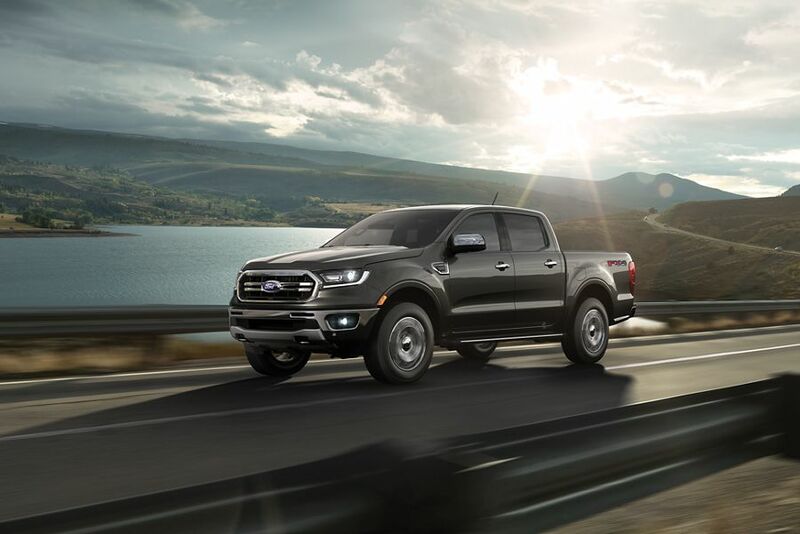 *Estimated fuel consumption ratings for 2019 Ranger 2.3L EcoBoost engine: 11.8 L/100km (24 mpg) city and 9.8 L/100km (29 mpg) hwy and 10.9 L/100km (26 mpg) combined, based on Government of Canada approved test methods. Actual fuel consumption will vary. You carry gear — and lots of it. 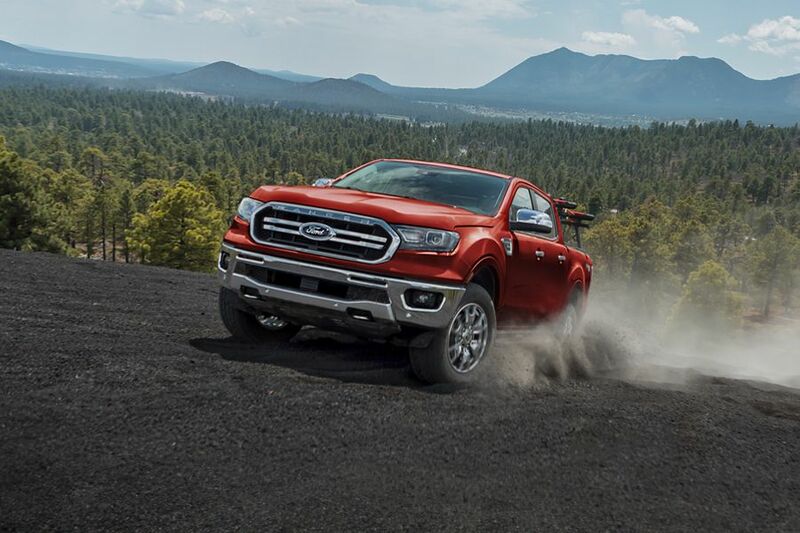 The new 2019 Ford Ranger has these big advantages over other gas-powered pickups: best-in-class maximum 1,650-lb. (748-kg) payload* and 7,500-lb. (3402-kg) tow** ratings. Need to haul more? Tow more? Head out to your next adventure in the all new Ranger. The foundation of outstanding off-road capability is strength. 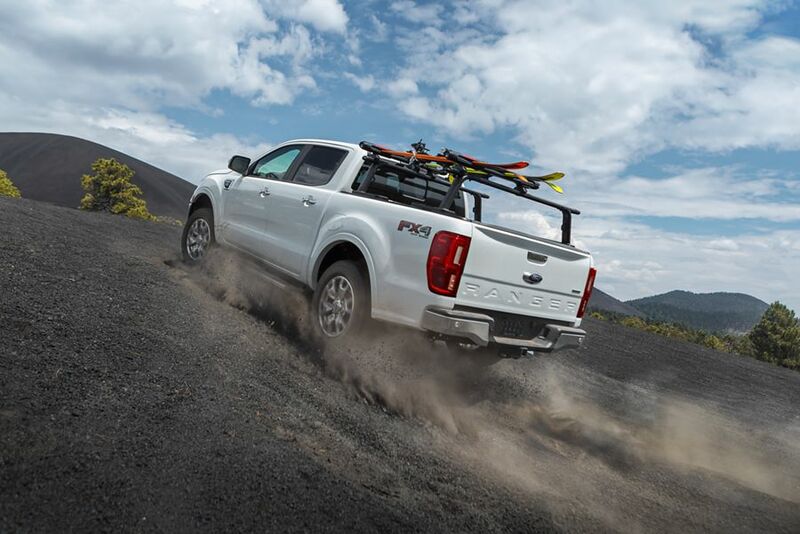 That’s why Ford engineers made the backbone of the new Ranger a fully boxed, high-strength steel frame with six crossmembers — plus steel bumpers and tow hooks mounted directly to the frame for ruggedness and durability. The new Ranger has a double A-arm independent front suspension engineered for agility and control over rugged off-road terrain. The shock absorbers are the monotube type designed for fade resistance and heat dissipation. They’re also nitrogen gas pressurized for shock-damping consistency over sustained rough road conditions. 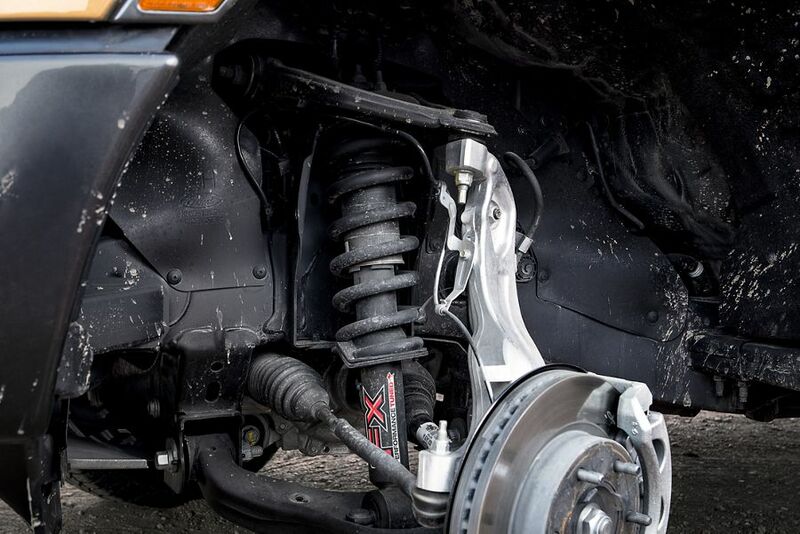 The rear suspension of the new Ranger delivers ride quality and control, both on and off the road. Which is why engineers chose two-stage parabolic leaf springs. Their flexible, low- friction design enables more axle movement and flexibility with reduced stiffness over the conventional multi-leaf springs typically used in high-load applications. They’re nitrogen gas pressured and designed for shock-damping consistency over sustained rough road conditions. The new Ford Ranger is perfectly at home on typical everyday paved roads. But going from mild to wild, where smooth pavement comes to an end — now we’re talking Ford Ranger territory. 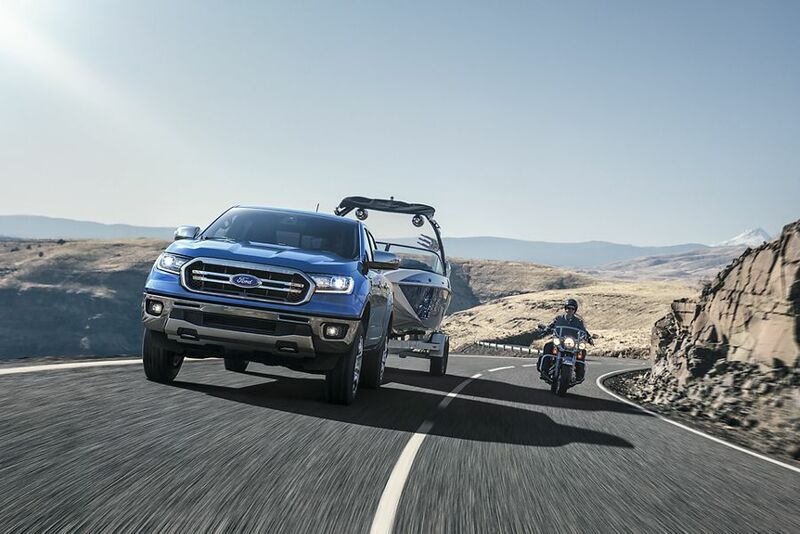 With its high-strength steel frame, off-road chassis components, frame-mounted steel bumpers, and EcoBoost® power, every Ranger is bred for adventure. And for the serious all-terrain enthusiast, Ranger can be outfitted with all the must-have features in the FX4 Off-Road Package. Shifting into four-wheel drive is as easy as turning a dial with the electronic shift-on-the-fly (ESOF) system. ESOF lets you choose between four-wheel-drive high and low modes, as well as two-wheel drive for travel on less challenging surfaces. Serious off-roaders know what they need to get max fun out of every adventure. It’s all in the FX4 Off-Road Package: Tuned off-road monotube shocks. All-terrain tires with aggressive tread. Traction-enhancing electronic-locking rear differential. Exposed steel front bash plate. Heavy-duty front skid plate. Skid plates for the electric power-assist steering (EPAS) electric motor, transfer case and fuel tank. And inside, a cluster screen provides feedback on pitch and roll plus steering angle. 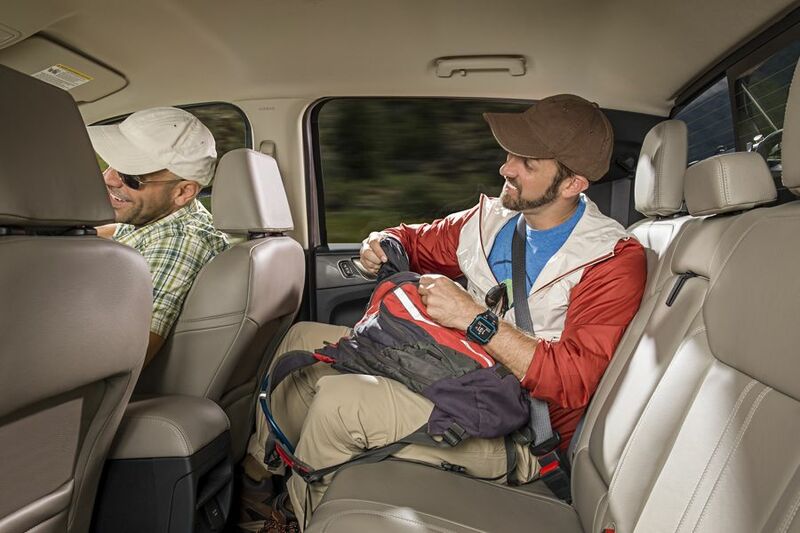 Included also are the Terrain Management System™ and Trail Control™ providing essential off-road technology. The available Terrain Management System™ automatically calibrates engine responsiveness, transmission gearing and vehicle control systems to provide the optimum traction, drivability and performance. Trail Control™ (included in the FX4 Off-Road Package) is a driver-activated cruise control system that helps you navigate more easily over rough terrain. It manages throttle and braking at individual wheels while maintaining a constant speed between one and 22.2 km/hr (20 mph). So you can focus all your attention on the thrill of steering over the demanding terrain. Travelling on tough off-road terrain can be anything but predictable. What starts out as a level patch of dry dirt can instantly become a stretch of rutted mud. That’s where the available electronic-locking rear differential (included in the FX4 Off-Road Package) comes into play. 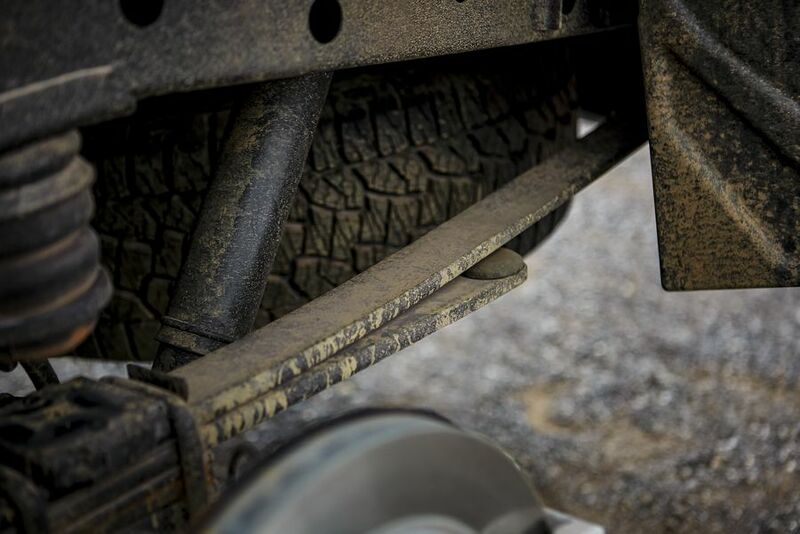 When activated, it locks the rear axle completely to optimize traction at both wheels simultaneously, improving off-road performance when the situation requires it. High-strength steel frame, steel frame-mounted bumpers and potent EcoBoost® torque give the new Ford Ranger outstanding all-terrain capability. The Ranger body shape says serious off-road performance as well. Approach, breakover and departure angles are designed to enable Ranger to climb hills and clear obstacles. Great design conveys more than just a vehicle’s appearance. It says just as much about a vehicle’s capability. From its dynamic twin power dome hood and wide grille to its rounded wheel arches and high ground clearance, the new Ranger says this is a pickup engineered for solid all-terrain performance. Enjoy the ride from the moment you leave for your adventure in the great outdoors until you’ve arrived back home. The new 2019 Ford Ranger. 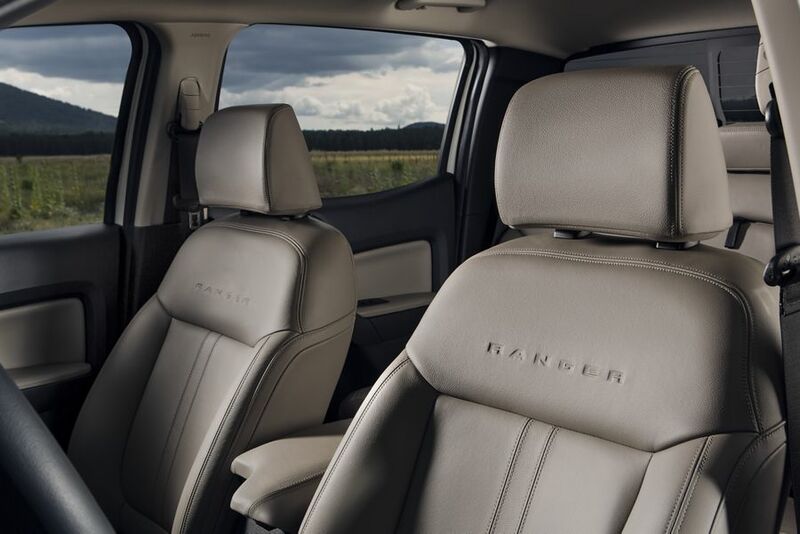 The Ranger interior carries over from the outside the emphasis on style and function— it also adds the important element of comfort. Seating is firm and supportive, with accommodations for up to five in the versatile and spacious four-door SuperCrew® model. Instruments and controls are easy to read and operate, with the 8-Inch centre touchscreen and the dual LCD instrument cluster productivity screens providing a variety of helpful operating information. 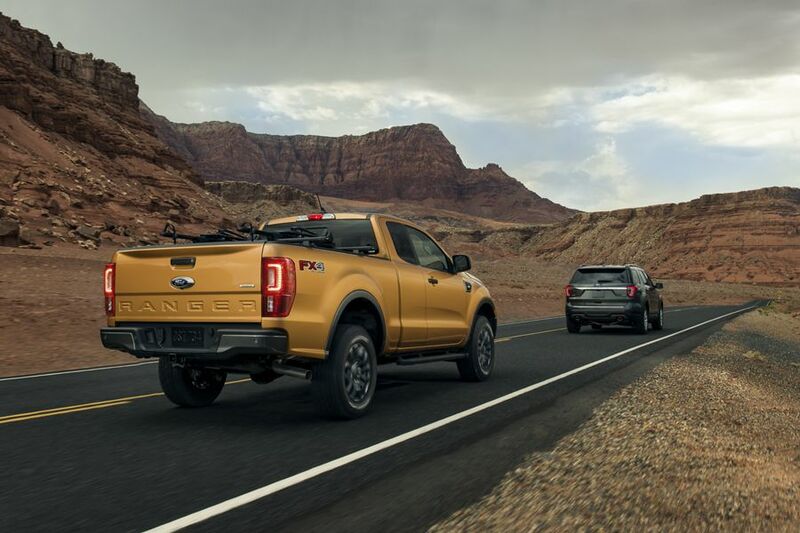 Additionally, the Ranger offers available driver-assist technologies, the latest in Ford connectivity and navigational features, as well as premium performance from Bang & Olufsen. Versatility is a big reason people drive pickup trucks. The Ford Ranger offers two ways to go. The SuperCab provides seating for two up front with bucket seats and two in the rear with the bench seat, which includes under-seat storage. If you want the space behind the front seats only for carrying gear, you can opt to have the rear seat removed (available in the XL model). The SuperCrew® with the conveniences of four full-size doors, seating for up to five, and rear under-seat storage. The SuperCab comes with a 6-ft. (1.8 metre) bed, the SuperCrew with a 5-ft. (1.5 metre) bed. The STX Appearance Package adds bold styling elements to the Ranger XL model. Included in the package are 17-Inch Silver-painted aluminum wheels, Carbon Black bumpers, fog lamps, box decal and premium cloth four-way Ebony Black seats. Designers applied the dynamic colour Magnetic to select areas of the Ranger exterior to create an enhanced sporty appearance. Available on XLT and LARIAT models, the Sport Appearance Package includes black grille with Magnetic surround on XLT or black grille with Magnetic surround and Magnetic bars on LARIAT, 17-Inch Magnetic-painted aluminum wheels or available 18-Inch machined aluminum wheels with Magnetic-painted pockets, Magnetic bumpers, Magnetic wheel lip mouldings and sport box decal. 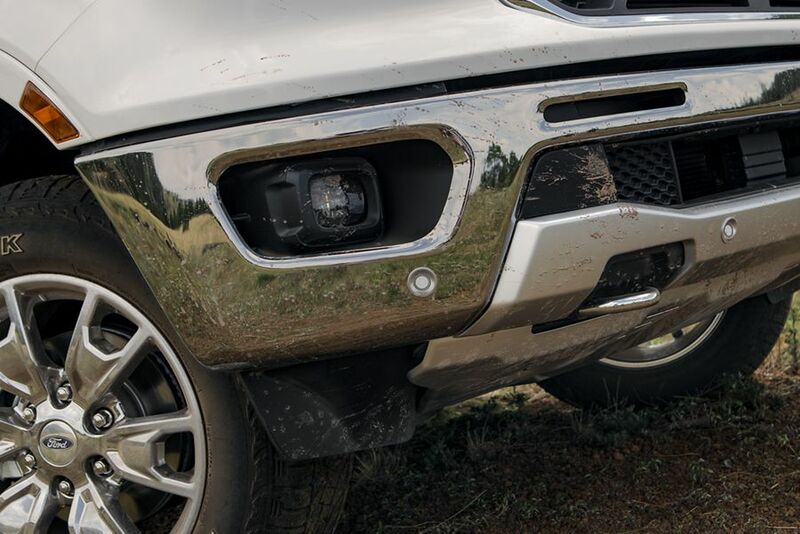 There’s nothing like the brilliant look of chrome to enhance the already striking style of the new Ford Ranger. There’s a Chrome Appearance Package for every Ranger model. The XL package comes with chrome bumpers, fog lamps, plus body-colour wheel lip mouldings. The XTR package comes with 17-Inch chrome-like PDV wheels (or available 18-inch chrome-like PVD wheels), an XTR 4x4 box decal, chrome door handles and tailgate handle, chrome exhaust tip, and chrome tow hooks. The LARIAT package includes, along with the XTR features above, its own unique chrome grille, 18-Inch chrome-like PDV wheels, plus chrome mirror end caps. Accessories let you dress up for style and outfit for adventure. Carriers and racks for transporting gear, like trail bikes and kayaks. Off-road lights. Pickup bed tents. Protective bed liners, and a whole lot more. They’re all available to personalize your Ford Ranger to your particular style.